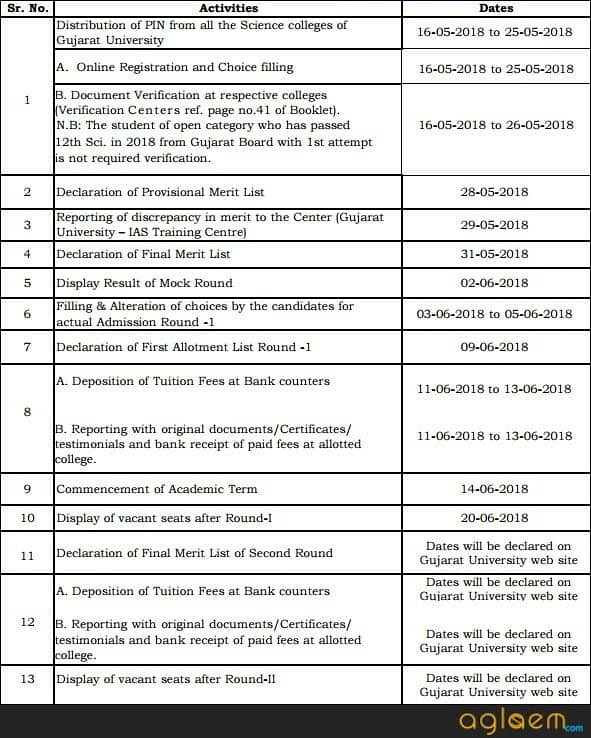 Gujarat University Admission 2019 has released the notification for the admission of eligible candidates for the academic year 2019 for fulfilling the various Undergraduate, Postgraduate courses. Candidates who are interested in Gujarat University Admission 2018 various course can apply by filling the application form for th session 2019, aspirants can check all the details on this page given below. Latest: Gujarat University released application form for Post Graduation in Dental & Medical 2019 admission. Scroll down to get the direct link. merit list prepared by the Admission Committee. Merit list will be made on the basis of qualifying examination as per applied courses. All the given data is based on last year information candidates are advised to use the given information as reference only. A candidate seeking admission shall apply on / line, for the registration of his/ her candidature, on the website, within the time limit specified by the Admission Committee. For the purpose of registration, a candidate shall be required to make payment of such sum towards the Registration fee, etc. as determined by the Admission Committee. Where a candidate has made more than one registrations, the registration made at the later stage shall be taken into consideration for admission purpose and the other registration shall be treated as cancelled. A repeater, reserved category or other board candidate shall be required to obtain the print out of the registration form and shall sign and submit the same, along with the self / attested copies of the requisite certificates and testimonials as specified in the registration form, at the Help Centre. An acknowledgement receipt for the same shall be given by the person authorized by the Admission Committee. 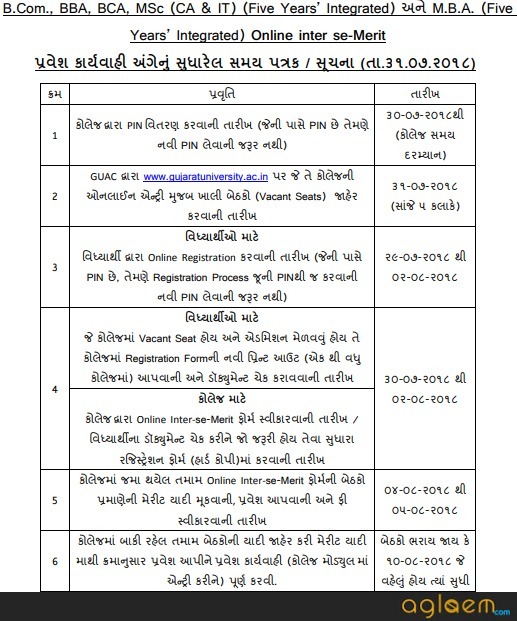 A fresh candidate (first attempt) of Gujarat Board is not required to do this process. Click here to Register for Post Graduation in Dental & Medical 2019 in Gujarat University. SSC Examination (Std. X) Mark / sheet. HSC Examination (Std. XII) Mark / sheet. School Leaving Certificate, Transfer Certificate or Migration Certificate. Caste certificate for a candidate belonging to Scheduled Castes (SC), Scheduled Tribes (ST) and Socially and Educationally Backward Classes (SEBC), issued by the authority empowered by the Gujarat State Government in this behalf. Valid Non- Creamy layer (NCL) certificate of the family, issued by the authority empowered by the State Government in this behalf. Certificate of Physical Disability, issued and duly signed by the Civil Surgeon/ competent Medical Authority, in case of a Physically Handicapped candidate. Certificate of Ex / Serviceman, duly issued by the Director, Sainik Welfare Board or by the District Sainik Welfare Officer. A copy of certificate of In / Serviceman duly issued by the Commanding Officer of the respective unit in which he/she is serving. Such other certificates as the Admission Committee deems necessary. A candidate who has passed the qualifying examination after appearing in the supplementary examination conducted by the Board shall be eligible for admission in the current academic year on vacant seats declared. A candidate who has passed the qualifying examination from other than Gujarat Board and CBSE form outside state shall be required to obtain Provisional Eligibility Certificate ( PEC) from Gujarat University before registration. For Undergraduate Courses: Candidates who want to take admission in UG Courses must have to complete the Higher Secondary examination with aggregate marks from recognised board. For Postgraduate Course: Candidates who want to take admission in PG Course must have to complete the Bachelor’s programme from recognised University / Colleges. The merit lists shall be displayed on the web / site of the Admission Committee and by such other means, as the Committee may consider convenient. The Admission Committee shall publish the schedule of online counselling program on its web / site, by advertisement in the prominent newspapers widely circulated in the university area, by web / site or by such other means, as it may consider convenient. The candidate shall be required to indicate minimum 15 his/her preference order of choices combination of subject groups in colleges or institutions online. Allotment of seats shall be made on the basis of merit, category of the candidate and availability of seats. The allotment of seats shall be published on the web / site of the Committee.The candidates are required to obtain the print out of the Information letter and bank fee receipt copies from the website. The candidate, for securing his/her admission, shall produce at the allotted college or institution only, the allotment/information letter, receipt of fee, all original documents and testimonials, for verification, within the specified time limit. Such candidate shall be eligible to participate in the successive rounds of counselling provided he/she has given option for the same. 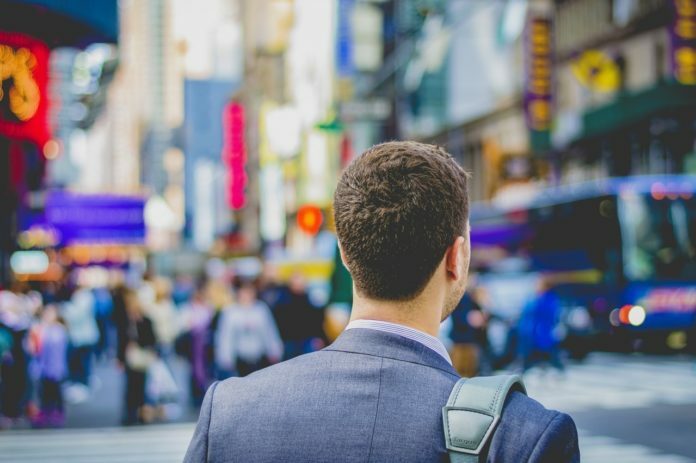 In case, the candidate fails to produce the aforesaid required documents within prescribed time limit, the admission offered to him shall be treated as cancelled. Even to go for successive round student has to pay prescribed fees after first round and to report to the allotted college. Where considerable number of seats fall vacant and it appears to the Committee to fill the vacant seats, it may conduct the on / line admission process for readjustment (reshuffling) of seats. The candidate, who opts to partake in reshuffling process, shall be considered for such admission. The candidate may either give option for up gradation of choices already given or submit new choices. If the candidate gets the admission on the basis of up / gradation or new choice, then his/her earlier admission shall be treated as cancelled. After offering admission to all the candidates whose name appear in the merit list or after completion of the admission process, if the seats remain vacant, such vacant seats shall be filled by the university school, department, college or institution, in accordance with the directions of the Admission Committee. Such university school, department, college or institution shall invite application from the eligible candidates after completion of admission process and prepare an inter / se common merit / list of all boards. Admission on vacant seats shall be completed within stipulated time period prescribed by Admission Committee. No admission shall be granted after that. All the given data is based on last year information candidates are advised to use the given information as reference only. A candidate who gets admission in the government, aided or unaided college or institution shall have to pay such fees, as may be determined by the Gujarat University. If a candidate, who has paid the fees after getting admission, gets his/her admission cancelled, his/her fees shall be refunded after completion of the admission process after deducting 10% of the fees paid. 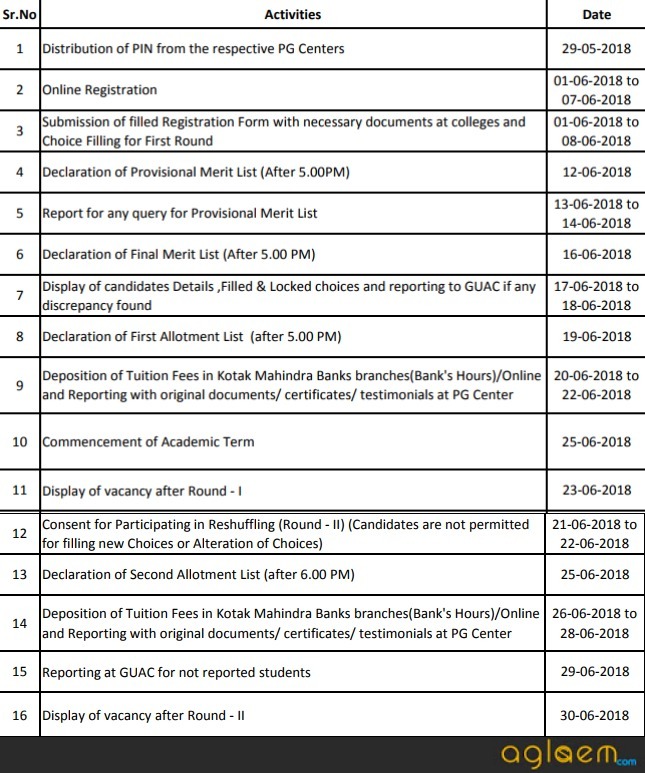 If a candidate who has paid the fees after getting admission and gets his/ her admission changed in another program and/or college or institution in the readjustment (reshuffling) process, he/she shall pay the difference of fees, if any, at the time of getting admission, or as the case may be, shall be refunded the fees after the completion of admission process. All the given data is based on last year information candidates are advised to use the given information as reference only. For the sake of the candidates seat matrix is given below. C. U. Shah Science College, Income Tax circle, Ashram Road, Ahmedabad. Shree Sahajanand College of Science, Sokli / Hansalpur Highway, Ta. Viramgam, Dist. Ahmedabad. Help centres will remain close on Sunday and Public Holiday. HELP CENTRE TIMING: 11 / 30 A.M. TO 4 / 30 P.M. The student of open category who has passed 12th Sci. in 2018 from Gujarat Board with 1st attempt is not required verification. 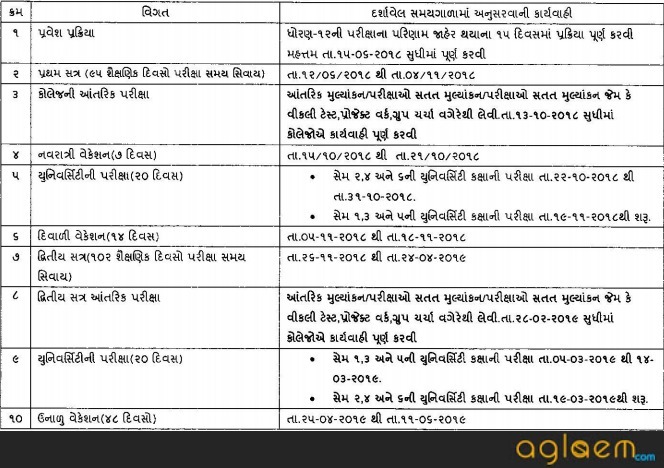 Other than Gujarat Board only Theory Marks are considered for B. Sc. 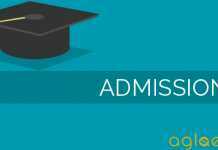 Sem – I admission. Students need to bring theory marks separately. Insofar, Application form for Gujarat University admission 2019 has been announced yet. Rest of the information on this page is based on last year information brochure and for reference purpose only. As soon as “Gujarat University” will release the information will be updated here.